Greetings classmates. I am hanging in there and telling myself to remain strong as I prepare to engage in the holiday season of fall semester as a first year graduate. In an effort to test my time management skills, We agreed for my partner, Angie to take a part-time job at the mall to get some holiday income. Schedules are still being figured out as we have a two year old and normal class & studio stuff. I noticed that a lot of people are commenting on the “class” stuff. Some instructors say to bend that to your normal body of work as much as possible because the grades don’t really matter in art school at this point. It is all about our work. I am unsure if that is sound advice or not but it does give me some relief when I find myself toiling away at some project that has little to do with my work. Tonight, we worked out our holiday plans. We are celebrating, Thanksgiving in Rantoul, IL (just north of UofI) with my partners aunt. The following weekend, my 14 year old is coming to Madison and we will have our own Thanksgiving. On December 13th, We will contrast our Pagan roots with Christianity and celebrate St. Lucia Day. Our family has done this for years. We put up our Star of light and our 2-year old will be the official Lucia this season. She is a bit young but hopefully she enjoy it. Most girls in our family have been Lucia two or three times. It usually turns into a melee of kids (boys included) making their own candle crowns and all claiming to be the goddess of light. Now that we have a plan, Angie and I have been working our schedules out to get me back into the studio for the next month. My first project is revisiting a sinking battleship game piece that I have been working on spuradically for the last two years. It is the size of a human coffin but designed after a battleship game piece. I plan on leaving it raw and slightly rusty. My next feat for it is the “list”. When I framed it up, it was sinking in back but straight on the XY axis. I think it looks like a bicycle ramp so I am going to prop it up, mark it and start torching away a large sliver to get it to lean to the side a little bit. I don’t want a happy slow sinking, I want the viewer to look at it and contemplate how they would escape if they were on that ship. When I watched Titanic, I kept asking myself over and over how I would have escaped. This question sticks with me still today. My first thought is that I would need to prepare and not tell anyone. Everyone would be in a panic (at least on a civilian liner) and if you built a one man raft, everyone would jump on until it popped and everyone became shark food. So, I know that I would have to act early and find things that float. When you see the aftermath of a sinking and all of that junk is floating in the ocean, that is the stuff that people should have saved. Second, I know that the water was freezing and I do not like wind. It makes me miserable. I would have searched the cabin or ship for something water proof and something rigid. Maybe something flat like a table top. I would have tied a couple of small weights to the table legs or any hardware underneath to act as a keel. I would have then tied some bouyant objects close to the corners of the table. I would have used a shower curtain or two to help stay dry from the splashes. Next, I would have brought extra rope. and there is always rope on a boat, incase I needed to lash any junk together from the wreckage. As I prepared my lifeboat to set sail, I would have ran to the kitchen and grabbed bacon, any smoked meat, maybe some fruit or grains high in energy and stuffed them in my pockets. 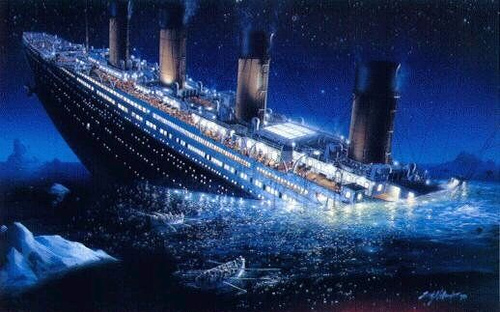 In the movie, at least, everyone ran to the stern as the bow submerged. This would be perfect. 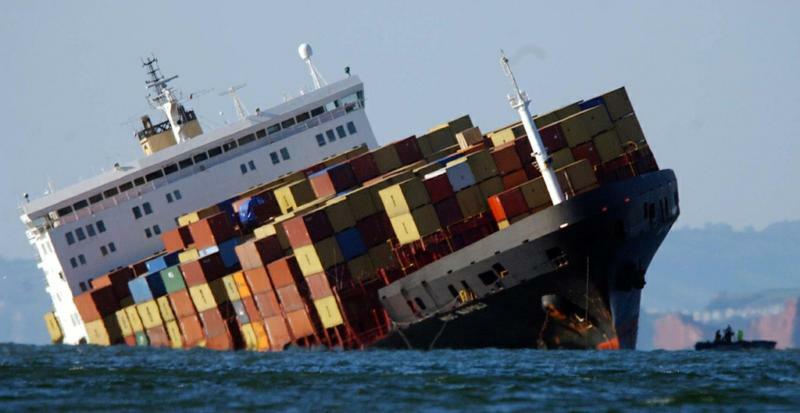 You know the ship is not going to come back up so, as soon as I gathered my supplies, I would grab my table raft and headed straight off the front of the ship. It would be easy to get away while the craft slowly sinks and everyone else would be at the other end of the ship. I know this sounds selfish, but it was just the problem that I set up for myself. I did not include family, friends or rational beings for that matter. This, as well as art are ways for me to deal with fears. I once did a series of drawings on unfinished basements. Other fears I have are Russian Roulette, escaping fire, tornado, and other natural disasters. I am not really scared of the natural disasters, I just like to scare myself with them and decide what I would do. Raising my oldest daughter, we would do tornado drills. We had a heavy table in the basement, near plumbing and a small window. We would have the girls start on the second floor and time them running to the basement. Maybe I over think situations. ? When I was a young’un in Scouts they always told me to be prepared. At the same time, I was watching Red Dawn and talking about nuclear blasts with my classmates. One last thing. I hate the idea of being on a submarine and I hate the idea of an iron maiden so I am also working on a small piece that has a hollow submarinesque shape with large bullets piercing into it’s void. Pretend it’s last week. Now, first off, I have to commend you on many hats worn here thus far. You seem confident in your direction, unafraid of making lots of work and willing to seize just about every opportunity that comes along- an excellent strategy I’d say, and you probably have no reason to worry about class work vs. your work. I like to think it’s all valuable at this point..
Wow, your fantasies bring you to some strange, extremely detailed scenes of preparation! Very interesting, I have no doubt they are well-founded. It would be great to see you acting these out in a frantic pantomime of sorts. Like wandering around anxiously in a dream. For as long as I can remember, I’ve had a horrible, irrational fear mingled with fascination of amputation and amputees. My dad actually has the same fear.. is it some distant genetic memory at work? It is not something I’ve ever explored directly in my work, mainly because I don’t feel entitled to, having no (actual) personal connection to the topic. Despite this, truncated figures and forms do appear frequently.. something I’ve often wondered about. Anyway, I digress. I’m glad we’ve gotten to know each other over the past few weeks. If I don’t see you in the meantime, happy St. Lucia Day! Sophia, Thanks for the great comments! You totally have entitlement to do amputee work. It is not the amputation that gives you the right, it is the phobia. Egyptians made art about phobias. A lot of contemporary artists have done the same. I think you should give yourself an exorcise and make some self portraits or something. Maybe you could draw your hand and leave a finger off and see how it makes you feel. The drawing may not be your masterpiece, but the emotions that you stir inside yourself might inform your work even more. ? I totally relate to your preparations for potential disaster, although my understanding of oceanic survival is so limited that any cockamamie plan I’d come up with to escape certain death would be laughable. And the laughableness of the situation would be lost since I’d be in the ocean, probably drowning. A tornado that hit my town when I was 9 left me severely traumatized–so much so that I had great difficulty functioning normally if there was a hint of a storm around. What’s terrible about Arkansas is that most people do not have basements, and most people do not shell out the extra money for a storm shelter either. I think that the basement issue has something to do with how soft the soil is. I could be wrong. Anyhow, when you don’t have a basement, and you see aftermath photos from F4 and F5 tornadoes, you begin to envy the cockroach’s ability to survive. I also just figured out today that you’re Jay Soliel. I’ve been wondering who that guy was. I think it’s a great idea to force viewer into thinking about their fears. The certain amount of anxiety that is created with slow rolling tension and need of preparedness is something that I find very stimulating. I too was a Boyscout and remember all of the great resources I learned from that experience. When I think about fears, I’m always drawn to the idea of Zombies. It’s very similar to your fear of sinking ship. In many ways a flailing, drowning victim can attract sharks (zombies). If there’s no cooperation, many times a group can destroy itself. It’s usually better to venture out alone, for the sake of your and other’s safety. But in all reality, none of the struggles against these fears really matter. For we all succumb to the same fate in the end. Besides, being a zombie (or a frozen popsicle) wouldn’t be half bad (or half good). When I thought of your fire drills I thought of the scene in Royal Tenenbaums where Ben Stiller drills his sons after the loss of his wife, as well as all the earthquake drills we had in grammar school (California). Talk about being unprepared! I too use fear in my work; mostly dealing with fear of discovery. And by that I mean discovery of past events I may have blocked out of my mind. I also hold onto fear of the mind’s ability in making up a falsified history. I think fear is ultimately a good tactic in grabbing the viewers attention; conceptually at least, the other way utilizing the relationship between gaze and aesthetics. I’m not sure if I can pull off a fearful reaction to my work. It may just be disgust and sympathy.